As a 1959 college student I was introduced to the Carnot maximum efficiency principle for a heat engine. I was sick to the heart that my chosen profession was to be 50% bad trash and only 50% good trash. I made myself a promise that when I was older and wiser, I would put these thermodynamic laws into a more fitting place called 'oblivion'. Another 38 years passed by. I had an accident and was confined to a recovery unit. I now had the time and inclination to do something. I very quickly found a perfect heat engine cycle. The problem was that its expansion was only 20% better than its compression work. I tried an ionised noble gas charge and Bingo! I now had a duality of PV & VI. This was a dream to work with because V & I is a ghost that has no effective engine mass. It is a 'Free Lunch'. Once upon a time there was a steam engine. No god ever hijacked the human brain as successfully as this device. Entrepreneurs were waving new money at the engine artisans. A cult called the Royal Society were controlling scientific education with rules which they called laws. This engine era became known as the Industrial Revolution. Money and greed ruled. It was a very bad time for thinking straight. As a mid fifties student the 1st thermodynamic law was simplistically explained as Heat = Energy. The 2nd law was a Thermometer? The former is a symbolic (0) which is given to represent the intersection of three axes x-y-z ... and by this datum (1-1) = 0 ... Consider that MASS CANNOT BE CREATED OR DESTROYED. Isaac Newton made such a statement. It clearly follows that in ABSOLUTE terms, (1-1) = (1) somewhere else. This value must represent the weak magnetic vacuum zero Aether carrier wave field. Physics has long stated that this vacuum condition has units of mass, length, time and a resonant light speed. THE SINGLE AND MOST VITAL DEFINITION IS …..
Centrifugal force … an INCREASING radial value of CIRCULAR MOTION. Centripetal force … a DECREASING value of CENTRIFUGAL FORCE. This puts Newton’s 3rd law of "instantaneous equal and opposite reaction" into oblivion. Flat line force and velocity cannot provide for a UNIVERSAL evolution. All motion in the universe is a sinusoidal resonant perpetual motion ripple and derived from the electro-mechanical transmission of LIGHT. Light is delivered as a DC battery output RIPPLE. INTRO to Diagram 4 …. When a gas is compressed so very slowly that there is a zero temperature rise, the power input is called the Work Done component (WD). The same gas compressed very quickly has a considerable temperature rise. Power input is now called Adiabatic which has TWO components called WD & Internal Energy (IE). Thermodynamics scholars have no explanation for this behaviour and call it CHAOTIC COMPRESSION. Gas has a secret that delivers its own "free lunch" of value 2IE every full cycle. Diagrams A and B show the difference between Chaos and Order for Argon at an initial temperature and pressure of 1 atm and 300o K. Compression index l = 1.66 = (WD+IE)/IE. A cynical American once quipped, regarding the quantum theory, 'sounds like the best free lunch in history'. This has now become a trite pearl of wisdom. It is most favoured by politicians who wish to get their fingers deeper into the pockets of the taxpayer. Much of this money is channelled back into scientific education. It is in itself a perpetual motion engine that protects the status quo but guarantees student brain death. No one has ever yet lost money by underestimating the intelligence of the public. They are too trusting. The taxpayer now firmly believes that there is no such thing as a free lunch. He should have said "all scientific history". University teaching poltroons should check out the practices that they preach. The three fundamentals that govern science are nothing more than the prayer bead rattling of axiomatic mantra chants. ISAAC NEWTON ...... universally credited with a theoretical solution for 'The Laws of Gravity'. He made three observations entitled 'Laws of Motion'. He does not mention ‘gravity’ or ‘power’ or ‘energy’. His consuming passion was gold, from any source whatsoever. He quit science for the gold, as master of the Royal Mint in London. For nearly 400 years the human race has been rotting away and "Lost in His Translation". And this is why. His force x velocity vectors have a phase angle of zero degrees (0o). THIS IS POWER .. NOT ENERGY. ENERGY can only be defined as force x velocity vectors that are 90o OUT OF PHASE. 1) Every object in a state of uniform motion remains in that state of motion unless an external force is applied to it. No mention of gravity here but he does suggest that PERPETUAL MOTION exists. It also effectively states that PERPETUAL MOTION can be increased or suffocated if the 'object' is subjected to another (plus or minus) external force. II) The relationship between an object's mass m, its acceleration a, and the applied force F is F = ma. Everything starts to go wrong here, because these later external force visitations are by his definition impulse forces and are of an mv nature [Aristotle and Quantum]. The situation can be rescued by making a = w2k, a radial rate of change of velocity [centrifugal/centripetal acceleration values]. This move can only be justified if a mass possesses a radius of gyration k and it is made internally dynamic by a wave event of frequency fo such that (2pfo)2 k = a. This would unify every force within science and make them multiples of the cause and effect of gravity. Physicists accept that all mass is extremely active internally by wave actions. They are clueless as to WHY? It is because all atoms are perpetual motion machines with an input-output of fusion-fission of light. Try to suffocate any mass internal action with an external force ... its frequency and light output will increase. It will go all the way to Oppenheimer's Mc2. Very true from outside the apple looking in. Not true from inside the apple looking out. Inside the 'free lunch' runs the business. For Heisenberg and Schrodinger Uncertainty and the Cat-in-a-Box. For Newton all matter was God made from 'indestructible but movable material. Solid, massy, hard and impenetrable. Never to wear or break in pieces. All made by God for the purpose of his creation'. A Neutralino Aether Meccano for God. All God had to do was say "LET THERE BE EVOLUTION BY CONDENSATION". The one and only mechanism in the Universe seems to have the essential characteristic of gravity. IT RESONANTLY VECTORS CENTRIFUGAL AND CENTRIPETAL FORCES TO PROVIDE A TANGENTIAL POWER TORQUE THAT DRIVES EVERYTHING. Faraday rules for generator and motor designs predict a ZERO effect for this arrangement. The assumption is that the two conductors will have an equal and opposite effect on each other. Not so. The effect is less than Faraday but now the windings are 100% efficient. Torques about the Y & Z axes are also present. The spinning up gas disc in A has properties of C Farads and will have an Hz spin value such that electrical energy = mechanical energy of an internal value CvTo J/kg represented by area ABC. The spun down expansion in B has properties of L and R Henrys and Ohms. There is an additional value of a spring return work done power of value (Cp-Cv)To J/kg. Area BCD of compression rule PV3.3= C. This will be the cause of the voltage rise and the amperes are most certainly the result of a mechanical MASS RELATIVITY. If the disc KE is Mv2/2 then charge mass generated should be Mv2/2c2. An example for a glass model engine having a 50 mm bore x 100 mm stroke. The glands are assumed to have zero leakage. A lab model would be inside a sealed glass bottle and charged at the same pressure as the engine. This chosen value is for a Po of 0.05 bar (mep), charged with the piston in mid position. Ambient To is assumed at 300°K. Argon values are MW = 39.9; Cp = 0.528 kJ/kg/°K and divide by 1.66 for Cv = 0.318; (Cp-Cv) = 0.21; R argon = 208.4 J/kg/°K and the gas volume is 0.000212 M3 for a charge mass of 0.000017 kg. Supply external ionisation and motor run volts. Every full rev will produce its own driving power of 2CvTo = 2 x 318 x 300°K x 0.000017 = 3.24J. At 1800 rpm this is a nett 97 W. An extra 64 W is produced but this is an unavailable self driving spring return. It is essential to stay close to the external supply switches and cut them to prevent over run. The engine should settle down to its own naturally selected frequency. If it does not, go again and delay switching. The engine will now auto surge to a higher speed if a Quantum impulse electrical, mechanical brake, or both are applied. The system is in an LCR resonance band width. A brake causes a fall in impedance and a surge in amperes. This is a well known phenomena. Diagram 6 shows the resonance diagram for this engine. I think the effective velocity of the spinning gas disc is always sonic. Not sure but it does appear to be very close. High disc spin causes high centrifugal pressure and the heat values may be converted to velocities in a turbo rocket equivalent. All atoms are such devices and they have a fission-fusion output-input of light. Diagram 3 shows a transfer of charge mass from A to B. If I make this an oscillation between the states of proton-neutron it makes the diagram universally key to everything. BBC TV scientists are now saying this can happen but they cannot say more unless they admit to where the information came from. Not directly from this site but there is a Cambridge astro-physicist who has had key data for fourteen years. He wrote me a note to say it was 'very important to the missing literature of physics'. Diagram 6 is a presentation of a new standard atomic model. One to resolve the mind blowing paradox of wave-particle duality, indeterminacy and the nature of a strong and weak force. All states exist within an interval of one periodic time. A tiny event at light speed is 'instantaneous'. With wrong laws of physics how do physicists dare to publish the parameters for Unification. This is why Einstein died frustrated and in failure. A strong force = tan 89.99924 x weak g force gives a 75,538:1 ratio. This has to be a better approach than the pronouncements of faith that are the fundamental diet of physicists. The latter have steadily infiltrated and interbred with engineers. They wanted a share of the new innovation money but lacked the experience and ability to earn it in a practically useful manner. The diagram below represents the behaviour of the unified atomic mass unit defined by physicists as the atom having a single nucleus. This AMU now has states of a, b, c and d which represent the beginning ... to the end ... and beginning again of ONE periodic time (T=1/f) and is contained within ONE wave length (l) and the velocity of light c = fl. The cycle has 3 degrees of ENERGY spin freedom and 2 of POWER reciprocation. A ratio of (3+2)/3 =1.66 ratio for a noble monatomic gas. The magnetic wave fission followed by the electric particle fusion is an essential behaviour for the existence of light. Energy is the property of spinning mass and its vector product of mass x velocity is always 90° out of phase. Power is the property of mass x velocity in a straight line and its vector product is always 0°. Power expenditure produces heat. Almost all the listed fundamental physical constants appear to have a root mean square value (rms). Anything with an rms value appears to have a particle-wave duality sickness. For example g in mg would be as an mv impulse force in power where g is a v. Is this Aristotle's take on mechanics? A latent force in energy would be mg where g is a radial acceleration. This means that the expression mg2/c2 is far from ridiculous and I believe this value will give the mass of fission-fusion light of any mass at rest on earth. The argon engine is clearly a Quantum device since it reciprocates and has a sinusoidal output. Some turbine equivalent systems are looked at now. It is not so obvious but these are the ones of special commercial value and are the essential solution to environmental pollution. Coal, oil and natural gas are just junk that nature buried out of the way. I believe that the earth's weather system is a superbly ordered fine tuning brake drag. It acts in concert with the molten core and ocean currents and helps keep a periodic time of 24 hours per day. Everything about nature seems to be all about keeping regular time. This could be the cause of EARTHQUAKE, TSUNAMI, FLOODS, AND HURRICANES because the power torque drive value of the Daily Earth Spin has a value equal to the friction drag of the iron core, the mantle, the crust, the ocean currents and - the most finely tuned control of all - the prevailing weather system. Global warming reduces the viscosity of the atmospheric weather and its ability to brake the spin. This is unacceptable and the above titled Heavy Brigade has to move in to keep PERFECT ORDER. a) PM of the 1st kind and b) PM of the 2nd kind. The 1st defines an engine which is perpetual but has no useful output. The 2nd is as the 1st but has a useful output. This means PM does exist but it cannot because the institutionalised cannot get to grips with it. The problem is the 'conservation of energy' rule is wrong. This makes the first law of thermodynamics wrong and the second law of thermodynamics should never have been written. It is merely a forlorn alibi for the murder of the preceding logic. All these conditions are essential ingredients of present day Science. By adopting the Second Law of Thermodynamics, an impenetrable wall has been erected against progress. This wall is an imaginary black hole of infinite capacity. It is officially referred to as an “Entropic sink”. It was originally created for physicists. Today it is used to club Presidents, Prime Ministers, Parliaments, Senates, their Advisors and the tax paying public, into submission. Diagram 5 is proof that the Entropic sink exists only in the imagination of a physicist. This data has been in the public domain for more than eight years. Science has studiously maintained a thunder of silence. It is quite obvious that Science will never provide a SOLUTION FOR GLOBAL WARMING. They are a very deeply committed CAUSE OF GLOBAL WARMING. Water is more valuable than oil in many parts of the world. A proposal is now made to present the ionised argon a continuous turbine flow mode and use it to distill fresh water. Nature does it so it should be possible. Electric heating equal to the internal energy value now goes to a brine heating phase before being restored to the gas. To get started the system would have to be charged far below atmospheric pressure for an acceptable ionisation voltage. An argon-helium mixture might be best for optimum heat transfer properties. Dumping heat enthalpy first would depress the flow temperature for a condensing optimum. Diagrams (a) and (b) below depict identical nozzles which have a flow rate of M kg/s of water at a velocity of V m/s. (a) impinges on a flat plate and (b) on a semi-circular plate. The Action and Reaction values are shown in terms of the MV Quantum impulse values. Condition (b) delivers a 2:1 free lunch. Isaac Newtonian “laws of physics” decree that it must be 400% less effective and not 200 but only 50% efficient. This was achieved by keeping the nozzle stationary and only the bucket dynamic. This HALVED the impulse force and QUARTERED the effective output. The free lunch only jumps out when the water is the CARRIED WAVE on the steel bucket CARRIER WAVE. This is the true RELATIVITY that evaded Einstein. The steel nozzles, arms and buckets of the Diagram 11 turbine can be considered as an Aether carrier wave. Water is the carried wave (light). V = steel nozzle velocity and 2V = ABSOLUTE water velocity and for RMS equilibrium relative V = V. Identical but constantly varying in and out of phase. The basic design equation is MV2 = 2MgH = gross Power torque. 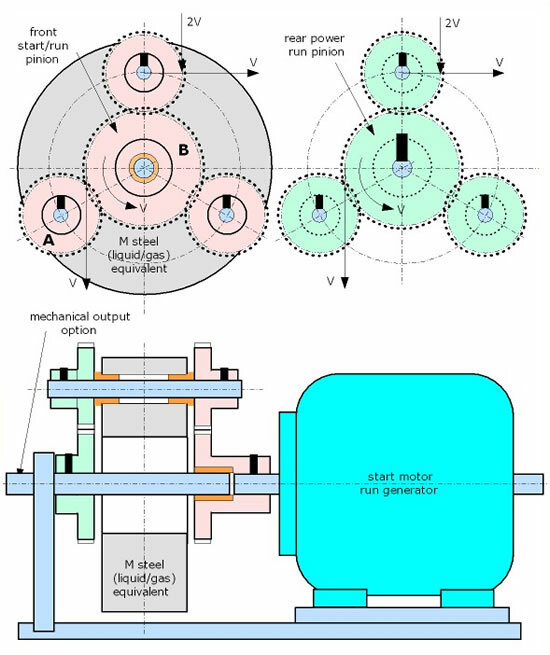 Consider a brake impulse dT on the output shaft of the water turbine. This will CAUSE +dT on the arms, nozzle and buckets. Instantaneously, the water flow FORCE DRIVE EFFECT increases by a value of +2dT. It is maintained by the constantly resonating Centrifugal-Centripetal/leading-lagging action of the “water hammering” in the turbine arms. The result is that every unit of brake power is automatically followed by 2 units of drive power.... The power torque output curve is as the sine wave rippling of an electric DC battery. Multiply by 1.875 for a stationary vane feature and output is 1.29 MW. We do not have to subtract the Pump Work from the output. More is possible but too greedy at this stage. The self pump work is internal and of magnitude MgH = 689 kW. The Bernoulli water flow energy conservation is wrong. H + Z + V2/2g = K. This is Power not Energy. Once again spin has been ignored and the whole Newtonian system comes crashing down. This proposal makes a direct analogy between the turbine water or gas flow rate and that of a fixed steel flywheel. Steel is given the degrees of freedom to float freely and spin on the main shaft. Just as water in the turbine pump arms is not connected to the steel arms and can lead and lag as it floats. Institutionalised science begins an analysis of mass motion by stopping and freezing an event into a zero period of time. Every event in the Universe has a finite period of time. This stopping of time for the convenience of analysis hides the true nature of the cause and effect of all events. It only delivers 50% of the real potential of Nature ..... E = Mc2 not Newtonian Mc2 /2? Consider the flywheel in diagram (b). If brought to a sudden impact stop it will deliver up MV2 of Power in Watts. The Power input to keep it spinning may be as low as 0.25 MV2 Watts. Coloured areas above and below the mean R (radius of gyration) indicate the "leading and "lagging" nature of the spin forces. It is very important. Diagram (c) shows the vector analysis for (b). It is identical to and better than 50% of what we are looking for. It is impossible to get from (c) to (a) if we allow the spin to stop. We have to find a way to maintain motion and at the same time, "extract discreet packets of power torque Quanta", from a system that automatically recovers them. Pinions A that carry the steel mass M must mimic the carried and carrier wave action of the water and gas turbines. This is why they are designed to have a pcd velocity of 2V. They hit the output pinion which is moving AWAY at velocity V. The impact drive force is given by Liza Simpson and ……. F = M(2V-V) multiply by V for output power torque of MV2 once again. Tyres and wheels should be heavy duty but suitable for indoor use. Magnetic clutch to disengage drive for manual operation via the front wheels. Electric steering box for long haul road use. 2 lightweight dry cell 12-V batteries. Charged alternately when start motor is in generator (dynamo) mode. Push button control panel; left or right or both, chair arm mounted. Rainproof buttons. Front wheel hubs at 680 mm approximately and about 1100 mm front to rear wheels. A 25 watt lamp and a camping tent temporary night light. An electric heat dump brake control. 700 watt engine output at 3000 rpm is based upon ONE 150 mm diameter flywheel x 82 thick for a mass of 11.5 kg. Gears are as detailed for the STEEL INERTIA QUANTUM DRIVE. Housing is 165 O/D in aluminium alloy and estimated gross weight is approx 13.5 kg inc. gearbox. For car boot storage ... detachable drive end and a folding front with canvas seat and back. This is so very well documented in engineering student texts. The mathematical solution is quite complex. The equation at my maths level was just a statement but is worth looking up because of its shape and two exy terms. A mathematics professor turned down a chance at it on the grounds that he did not feel qualified. I feed back the damping power to the forcing power. The books have it remote and externally applied. I think the professor could have done it in his sleep. I think he was too scared to see the answer and he was more afraid of the rest of the site than he was of the brain challenge. I put the diagram onto a forum last year. A young American girl posted to say that her grandfather had one working in his cellar for 4 months continuously. It looked similar to this device.For some reason it stopped. I would not expect this to run for such a time. Too much clanking and banging. Mass M must first be pulled down by hand. Release it and if the design proportions are good enough it will settle down to its own naturally selected LCR frequency. This is not quite in context with the rest of the site but it looks to be important. I had some bits of steel and some time to doodle away. The frame radius of gyration was a freak chance dimension. I moved home and the frame and data were lost during the move. I have a good recall of the data. There was a massive change as a resonance band at 0.43 Tesla (rms) was reached in the unlaminated iron core. The iron core mass M was 0.66 kg. There were 1150 turns of 0.315 mm wire in each coil. As I type now I can see that if the secondary coil had been wound in the opposite direction, I might well have got a +dV in the secondary sense winding. The core iron had a peak of 0.6 T at 365 AT/M. Start voltage was applied and the primary had a normal reactance. The secondary was always zero V. As the current was increased and the flux density rose to 0.43 rms, the reactance totally disappeared and became IR volts. The iron was quite hot and estimated at 0.66 x 9.812 = 64W. The copper loss heat was 16 W. The secondary coil remained cold and was super conducting. It was also impervious to heat conduction from the iron core. A Hungarian company is now working on this but I have no feedback because of commercial interests. I will co-operate with anyone who wants more. Diagrams 17 and 18 give some details. DO NOT USE THE AIR GAP FEATURE. Steel only goes to max magnetic saturation for working resonance. An external (false gravity) force, rockets up the output 4, 9, 16 and 25 times and onwards. First go to Diagram 18 above. This shows that a Change in Voltage is dependent upon the rotation of the magnetic flux (charge on the electron) and Direction of Current inside the conductor. The basic formula needed are stated below. In addition ... Energy storage potential of vacuum (air) is approx 1450 times GREATER than average commercial steel. From Relative permeability curves. Volumetric storage value of the iron is therefore neglected here. µ0=4P/107 Henrys and electrical frequency Hz also stated as a mechanical equivalent f cycles per sec. Steel peak permeability Tesla values are assumed to be ß=0.6T max and divide by root 2 for 0.43T rms. Ø=magnetic flux in Webers and divide by area A for flux density ß Tesla. Voltage change/coil turn is given by Ndø/dt and for the model is 1(0.43x0.01x0.05)2P60=0.081 Volts. Design f is 60 Hz and radius of spin gyration k=26 mm to give 2Pk60=9.81 m/s PARTICLE VELOCITY. When g has m/s2 units the property is RADIAL/CENTRIFUGAL WAVE ACCELERATION. Volume of air gap V = LWt (50;10 and 2.7)mm = (0.05x0.01x0.0027)=1.35x10-6 m3. Air/vacuum magnetic storage value in Watts = ß2maxV.107.f/4 = 73 Watts = Mg2 = 75W for frame steel estimated mass of 0.77 kg. Ampere turns from 75/0.081volts = 926 amps = ßrms.t.107/4P from which t = 2.7 mm. Choose 4A/turn coil then N = 232 coils for a voltage of 18.8 Volts and 18.8x4 = 75.2 W which is OK. Estimate 30 metres of 0.71mm copper wire of R = 1.5 W and heat loss = 24 W.
The current flow directions in the diagram are taken from the standard commercial laminated transformer performance. This is a transformer that cannot work without the ‘eddy currents’. Laminations have no effect upon the eddy current value. It merely puts them in parallel resistance and assumes that an ‘undesirable nuisance’ has been dealt with. The results of this experiment will probably provide a SINUSOIDAL DIRECT CURRENT RIPPLE. The true operating principle of the light spectrum. An astro-physics singularity is a mathematical euphemism for an absurdity. An engineer cannot continue with an absurdity based on non-existent laws of faith. For stability, all mass must radiate and absorb light and even at the gravitational limit of a condensed black hole this is true. If a trigger suffocates the emission of light from plutonium, there is a nuclear explosion and new helium is formed. An aether condensed black hole at the centre of every galaxy would burst its poles in a continuous nuclear explosion. The emissions will form spiral galaxy arms that recycle back to a strange attractor. A postulate by Henri Poincare. Helium would begin to form in the arms and all the elements we know of and all planetary mass would evolve. On the basis that only light can travel at the speed of light; all mass accelerated to C will become light and a principle called the conservation of mass equilibrium and E = ±Mc2 fusion - fission is a benign mechanism. This will be the mechanism for all reflected images and the mechanism for consciousness too. Mass relativity not time rules here. Mass creates its own periodic length and time. These science units are best shown as M(LT). A neutrino aether vacuum is proposed. It has a resonant carrier wave speed of 299 792 458 m/s. If the neutrino is the only indivisible particle it would have a density of about 1.12x 1013 kg/m3. This would also be the density of a black hole and is estimated from the standard electron data. It is 100,000,000 times that of lead but our values are relative evaluations. In an absolute system all mass densities are identical. The frequency of light on a carrier wave will add or subtract to give an observed frequency value. This will give rise to red and blue shifting. For resonant impedance of the vacuum Xl = Xc .Suffixes l and c refer to the Universal inductance (Henrys) and capacitance (Farads) of vacuum1. Vacuum constants are given as mo = 4p x 10-7 Henrys and xo = 8.8452 x 10-12 Farads. Zo = 376.73 ohms impedance. These constants and the condition for resonance give a value for a carrier wave velocity of 299 792 448 m.s-1. If all galaxy mass is indeed the result of condensed aether why is the Universe not a single infinite galaxy? In an infinite universe it would take an infinite amount of time for this to happen. Not acceptable. Unfinished business is unacceptable. The submission is that the aether has a very weak Tesla value and must therefore have a condensing pressure. A steady state will exist when all condensed galaxy mass will exert a counter pull. At this point the universe will be in equilibrium. The pendulum mass for this design is allowed to reciprocate on the pendulum rod. The mass is fitted internally with a ball slide bearing. A tension spring is fitted and fixed at one end to the mass and at the other end to the pendulum rod. Newtonian teaching states that centripetal force is the instantaneous equal and opposite of the centrifugal force. Not true. The diagram gives details of the sinusoidal earth spring deflection. Always referred to as an ELLIPTICAL orbit. Details were Googled as Solar System data. This will be the value caused by the Resonant Aether Carrier Wave. Diagram 23 below shows the pictorial representation of an externally driven event by Newtonian Laws. The diagram opposite shows the same event but this time it has TWICE the power and is INTERNALLY DRIVEN AND PERPETUALLY MAINTAINED. Physics is and always has been Chinese Whispered Newton. Before the information in Diagram 5 was made public, Quantum theory was just a guessing game. It was even treated with some derision by many physicists. Day to day engineering, which can only exist by serving the taxpayer, has been infiltrated by the games of physicists, for at least 150 years. Physicists live off the taxpayer and are unemployable by public listed engineering companies. They operate within a Cult which is devoted to the “proliferation of physics wisdom”; by a virus called the “Laws of Physics”, they have held back real progress in engineering for at least 150 years. The two most important concepts of Newtonian science do not exist in the real Universe. They are ……. The efficiency concept of OUTPUT/INPUT is always ONE and the fusion-fission of light value. The concept of Potential Energy (PE) Joules does not exist because all QUANTUM engines of mass are PERPETUALLY ANIMATED and can only exhibit the properties of WATTS.